Should players be cautioned for NOT celebrating a goal against a former team? Now there is a question and one that I hope gets people debating on here. I am referring in particular about Frank Lampard's reaction at Eastlands to scoring the equaliser against Chelsea last week. The reason for my post this morning is this article written by Matthew Norman in the Telegraph this week. If you ask me, you have to judge each incident on their own individual merits. For Norman to complain and state that Lampard should receive the same punishment as those who jump into the crowd or take their shirt off is simply ridiculous. The bare details of the Lampard outrage, for those who missed it, are as follows. Soon after being brought on as a substitute for Manchester City, with whom he is on loan, Lampard equalised against Chelsea, for whom he played long enough to become the club’s leading scorer, a “legend”, and quite possibly “a talisman”. His cloying show of mock piety ruined the moment for the millions watching on telly, who do not pay Sky Sports its monthly bounty for self-serving exhibitions of faux loyalty that denude football of its drama. This nauseating play-acting has to stop. If the FA was willing to legislate against over-celebrating, as with the ninnyish mandatory yellow card for removing a shirt, it can and must do so against under-celebrating and not celebrating at all. Any player who betrays his audience by confusing the scoring of an important goal with attending a state funeral should be shown a yellow card immediately. You see my point? It's ridiculous isn't it. Lampard had served our club for thirteen years and in my view, is our greatest ever. If he acted the same way as Gus Poyet did playing for Tottenham against Chelsea, when Tottenham scored, it would have been like a knife in our hearts. 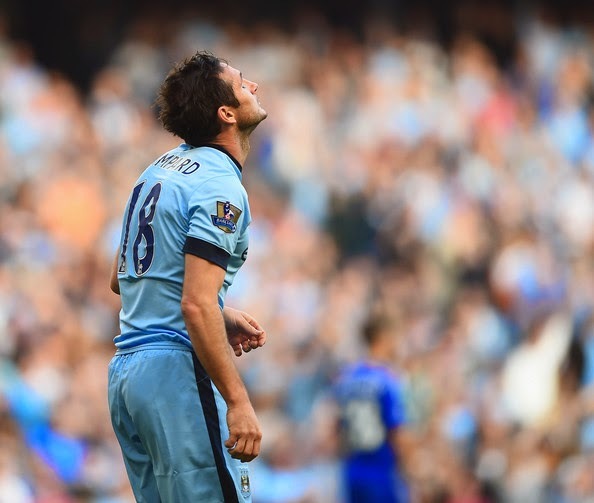 Frank Lampard is and remains a class act and a true professional. For these people who sit on their arses all day, making out that they know a thing or two about football, when they have never kicked a ball in their lives, it's all about copy. The general impression I have from the article and it's editor is exactly that. Maybe someone should show this bloke the yellow card for being an absolute moron and rather than put together something like this in jest for entertainment, he should focus on more important issues. As for the whole point of this post, I want to ask YOU the football supporter reading this (from whatever club you support) article what your opinion is on players who choose not to celebrate scoring against an old side?